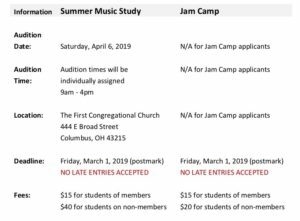 The Ohio Music Teachers Association Central East District, CEOhioMTA, is pleased to offer scholarships to eligible students. The goal of the scholarship is to broaden the student’s exposure to music through something outside the regular routine. Scholarships are sponsored by both local businesses and the CEOhioMTA and range from $100 to the $700 Graduating Senior Award (used for tuition reimbursement for students majoring in music). 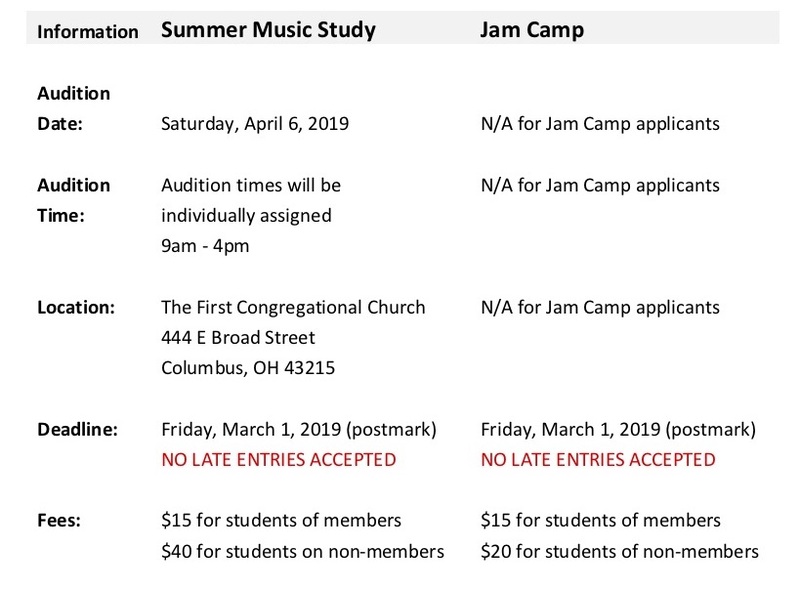 Summer Music Study Scholarships may be used to pay for a music camp (excluding Jam Camp), master class, workshop, institute, special lessons, or coaching, separate from study with the teacher of current enrollment (the scholarship award should not benefit the current teacher of study or relatives of the student’s teacher). If you would like to use an awarded scholarship for something other than listed above, the teacher must contact the chairperson for prior approval—before submitting the application. Jam Camp Scholarships must be used to attend Jam Camp sponsored by CEOhioMTA. The above table shows audition dates, times, location, deadline and fees. This event is open to all students within the Central East District (both teacher and student must reside in the District). Please refer to the specific scholarship for the age and study requirements. Previous recipients are not eligible to apply the year following their award, with the exception of future music majors auditioning for the Graduation Senior Award ($700 college tuition reimbursement). Summer Music Study Scholarship applicants will be judged on the quality of their performance (50%), submitted essays (30%) and sight-reading ability (20%). Jam Camp Scholarship applicants will be judged on their submitted essay only. To download a complete list of Rules and Regulations, click link below. Please read all five pages. Applications missing any component will be returned.